Paralleling Arrays to share inverters. Grid-tie is the way to go (if you have it)! See why. Geothermal Heatpump that eliminates our 1000 gal/year oil burning. Solar augmented Salvage Prius eliminates 500 gal/year oil burning. Solar Energy is now cost effective in every state in the USA! In 2009 the brakeven was only a few sunny states when solar costs were $9 per watt. But every state became cost effective by the time prices fell to $4 per watt back in 2011. Now in 2016 costs in Maryland are $2.75 or so and the solar panels themselves are as low as 50 cents/watt for do-it-yourselfers. 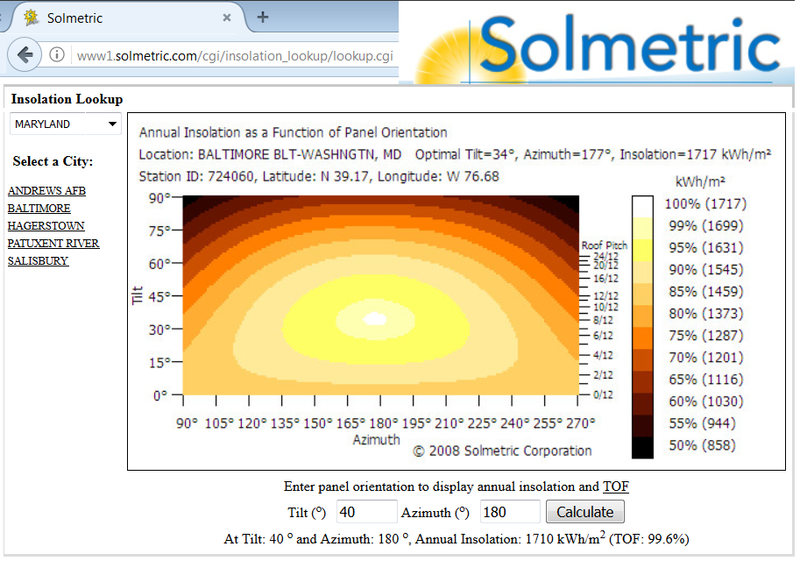 The Insolation plot above right shows the total annual energy for panels at all possible orientatinos and angles. It is easy to see that anything from SE to SW can still provide over 95% efficiency and even East and West panels at lower tilts are still above 85% efficiency. Now it is impossible to ignore the positive environmental and economic benefits of solar. Solar is here and is a major player in our future. See the interactive Solar map of the USA. The wind map is even more impressive! The other 2009 chart shows the 12:1 drop in panel prices over the last decades and 3:1 drop in just the last few years. Solar panels are now less than 75 cents a watt!. The world exponential growth in production of solar PV panels and the 2010 value of 14,000 MW is not even shown full scale on this chart! The 2013 bar would hit your ceiling! Solar Thermal Water Heating is obsolete: With the high efficiency of modern heatpump systems and the dramatic drop in cost of PV solar panels, the only cost effective way to heat water these days is with PV panels and a heatpump. Even since 2006 solar thermal hot water heating was dead. Now with solar PV dropping ten to one since then, Solar Thermal water heating is really, really dead. So we did not even think once about solar hot water heating. Eagles Nest: On this project, the original arrays faced Southeast, but then in the Spring 2014, we added another 3 kW array facing Southwest on top of the garage. 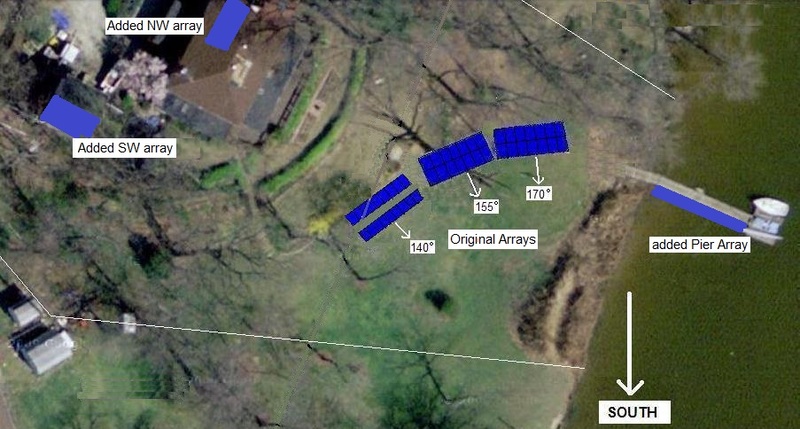 Since this new array begins to get full sun in the afternoon at the same time that the SE arrays begin to be shaded, we were able to simply connect them in parallel to the same inverter. This way, we doubled the power production with no increase in inverter cost. See full description. 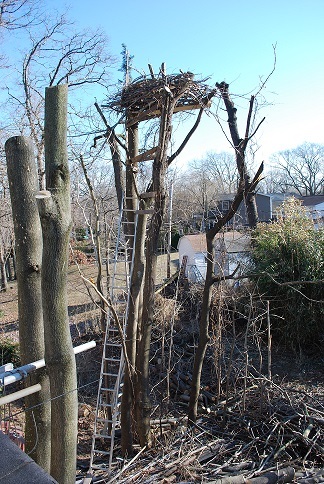 But to clear the roof for solar, we had to top off the SW trees and the stubs left standing seemed ideal as a support for an Eagles nest. So we built it, including camera. But missed the nesting season this year. So far, no guests... Maybe next year. The Grid is Golden! 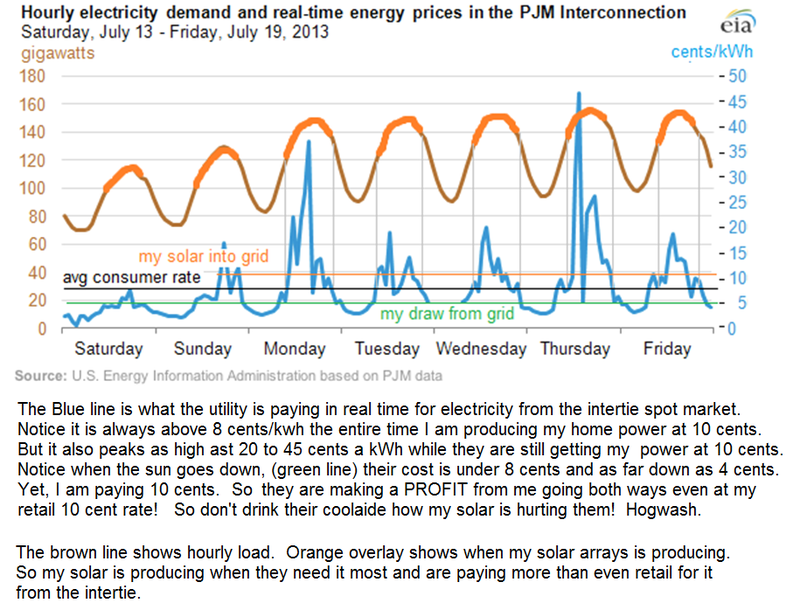 Going Off-Grid makes NO SENSE (if you have access to it): If you don't have access to the grid, solar is a still a great source of energy... but at about 3 times the cost of grid-tie. In addition, it condems you to a life of sacrifice, and maintenance issues due to having to maintain your own batteries. If you DO have the grid, it is Golden! Never give it up! Even if you consume no net power from the grid, just using it as storage more than DOUBLEs the efficinecy of your system compared to being off grid. See why! Do not be mislead into going OFF-GRID if you have it! Original three Southeast arrays totaling 8 kW. Added 3 kW Garage roof array to SW.
Added 3 kW NorthWest facing house roof array. Added 3 kW array on pier. Temporary Array: The first 8kW of panels that we wanted to install on this waterfront property shown above were just propped up in the backyard on 2x4's because of the years long struggle to get county and state approvals to put some of them on a pier in the creek. After testifying for a vairance, they were permanently mounted there becuase, it took 4 years later for the state to finally drop its prohibition to solar on piers . Pictures below show the 3 inverters and basement wiring. 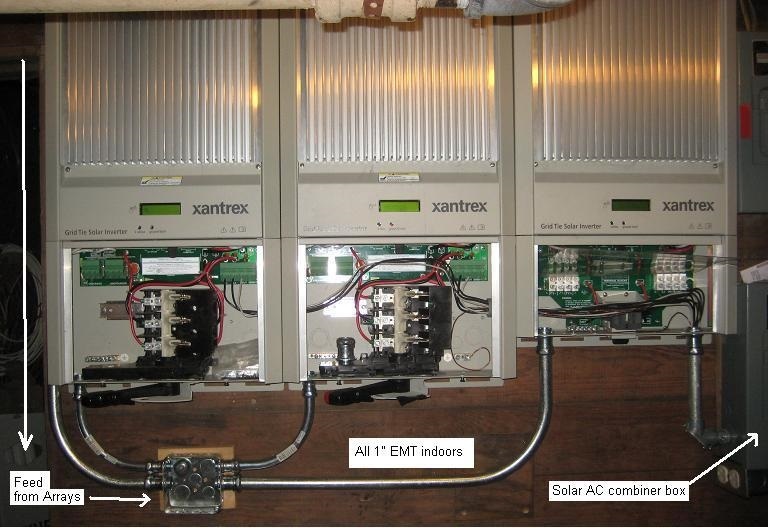 Inverters: The image above shows the three 2.8 kW inverters. We went with three separate identical 2.8 kW inverters rather than one large inverter for redundancy and reliability. Notice that all indoor high voltage solar DC wiring must be in metal conduit due to the fire hazard when HV DC is disconnected or the result of a bad connection. Distribution Wiring: The next photo shows how the inverters are connected to the distribution panel. 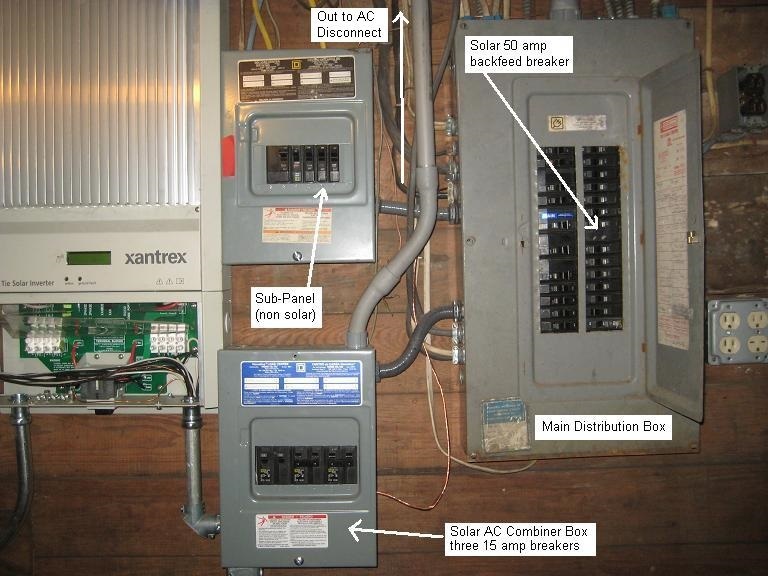 The three 240v AC outputs are combined via three 15 amp dual breakers in a combiner box and sent the combined 240 VAC outside to the "solar Disconnect" switch by the electric meter required by the utility. Then it comes back inside and simply goes to a 50 amp breaker in the normal distribution panel shown on the right. Solar Electric Boat: Before we simply changed out the 40 Hp Johnson on this old runabout and added trolling motors and solar panels, the original plan-B if we could not get permissions on the pier or in the yard was to build a Solar Boat floating on foam insulation which contains a similar number of panels providing not only propulsion when underway, but also an additional 2.8 kW of charging power when moored. See the sketch. The structure on the boat would fold down for storage. Accessories would be stored flat while the boat was moored. . The sunward panel is kept at its high winter position while underway and the shadow side is tilted almost 180 degrees to face outward and provide a nice side to the boat, or power when the sun is on that side. When moored, all the structures would be folded down and both arrays tilt to the sun at the proper angles for summer and winter as shown here. Pier Blocked by MDE! Originally, the panels-on-piers idea was blocked by the Maryland Department of the Environment "because solar panels have nothing to do with the water". Apparently, the MDE considered the only approvable use of a pier to be for access to a gas burning, oil-leaking, energy consuming, noise generating, bay-polluting, air-fouling fossil fuel stink-pot boat. Anything for supporting a gas boat is OK. But putting solar panels on a pier to power a non-polluting, clean energy electric boat and routing the surplus back into the grid to provide the same improvement to the environment as 300 trees, is not! Note: (solar-on-piers is no longer prohibited at the state level, though it is still up to the local jurisdiction (which will require a variance) to get any approval (if any). Above is the sketch of the floating pier application. It fit completely within the standard limits for a pier, 100 feet long, with no more than 200 sqft of additional platform and no more than two 3' wide finger piers. MDE says they would approve the pier (it meets all requirements) but denied the design because it included the solar panels. Even with the support of the Governor, and after several months of internal debate, the law prior to 2013 did not allow anything on piers that was not water dependent. At the same time, the plans had been approved by Anne Arundel County, by the Feds (Army Corps of Engineers), by the Maryland Energy Administration and by both of the neighbors. Only the MDE law was in opposition to this clean energy project. Which is a paradox, because if we don't switch to solar, the electric consumption from the coal plant 4 miles down the creek will continue to pollute the Bay! See next section. Maryland Bill HR 1266: Fortunately, in 2011 our local delegate, Kipke, authored a bill to make an exception for solar panels on piers. See HR 1266. This was presented to the Maryland House Committee on the Environment in March 2011. Only the Maryland Department of the Environment, the County representative and the delegate from Severna Park were opposed. It was killed in committee. 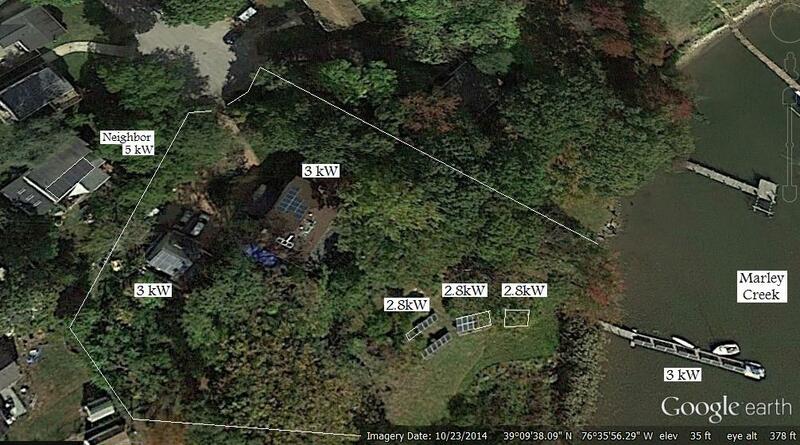 This one home's share of this coal-fired electricity pollution was falling on the nearby Chesapeake Bay and watershed. Even though we wanted to eliminate the contribution to this pollution by installing an 8 kW clean-solar system we were blocked by an outdated and short-sighted law of the Maryland Department of the Environment who are charged with protecting not just the water under the pier, but the air above and the soil beneath. On 16 April 2010 a reporter Eric Hartley did an article in the Annapolis Capital Newspaper and Tim Wheeler of the Baltimore Sun did a nice story in the paper on this issue. And also on his B'More green Blog. Despite the tremendous value and growth in solar in Maryland, apparently there was still zero progress by the Marynald MDE and MEA. . Simply moving them to the yard was not easy either!!! 2014 UPDATE: The image above shows my current system with three new arrays. The SW one was added on the roof of the garage and parallelled into one of the original SE arrays to share the same inverter. THe NW array was on the roof of the main house and gets no winter sun, but is parallelled into another of the SE faciing original arrays to extend Sun by several hours on that inverter. The final array was the long sought 12 panels on the pier. Now back to HISTORY until I ever find time to re-write this page and simplify it. Environmental Benefits of Solar: The above two images show the pollution-elimination impact of this solar project. Each 3'x 5' panel eliminates about the same amount of pollutants in a year as about 8 mature trees remove in a year. This means a 42 panel array is equivalent to the environmental benefits of about 300 trees compared to coal. But even more telling is to look at not just the pollution impact of coal electricity, but also the sheer magnitude of environmental distruction. Unseen Impact of Coal Electricity: In the image to the far right are 4 tons of coal which is about the energy equivalent of the 10 MHhrs of energy our house requires per year. Not only do we energy-consuming-&-wasteful Americans not see this tonnage, we also do not see the 80 tons of trees, topsoil, habitat and dirt that has to be pushed off a mountain top in West Virginia and into the nearby valleys and streams just to get to that coal. 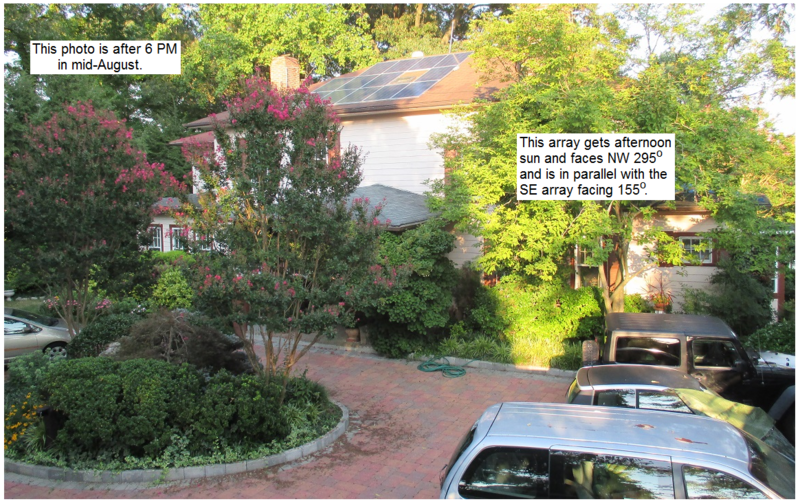 This 80 tons of decimation of the environment PER YEAR for one house is shown in the near image to the right which shows four 20 ton freight cars needed to move that debris. The next image below right is just one of the hundreds of mountains and habitat in West Virginia being destroyed for our coal energy addiction... Folks, this approach to our environment IS NOT SUSTAINABLE! Variance Issues: With the proponderance of benefits of this solar project in the front yard, the County did agree that the varance was appropriate, but with one big catch-22 provision. They required the standard mitigation for any variance in the 100' foot critical area buffer. This means that the disturbance in the buffer area (690 square feet) must be offset with 3-to-1 or 2000 square feet of new trees. In otherwords, we can have the solar panels in the sunny part of the yard, but we have to plant so many trees in compensation that the lawn becomes a forest and we are back to square-ONE, that is, no solar access! The Hearing Judge rolled his eyes at that Zoning office requirement and approved the variance but without making any ruling on the mitigation issue. 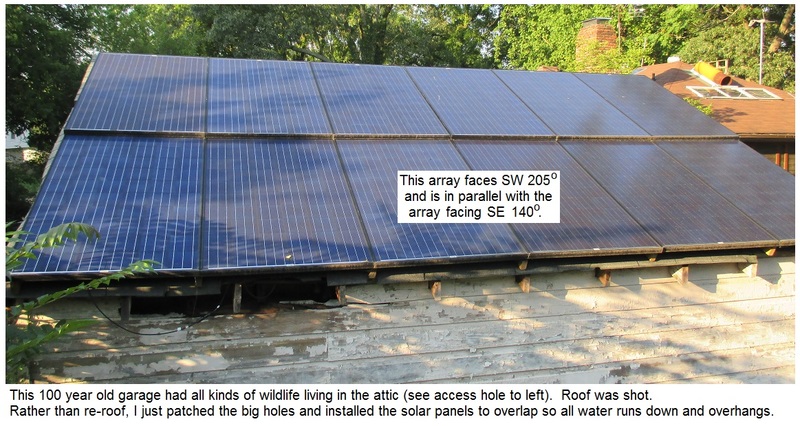 To date (2014) the state still does not recognize the 8-to-1 self-mitigating benefits of Solar panels to the environment. Our first alternative energy project was a Solar Plug-in Hybrid Electric Vehicle (PHEV) built from a salvage Prius.. It had been totaled on the drivers side, but we just beat it out with a sledge hammer and coverd the bashed-in door with the white sign! This soon morphed into a Prius Field-Day Power project to combine high power solar, with thousands of watts of backup engine driven generator power in the Prius for providing emergency power for field operating events such as the annual Amateur Radio Field Day or Scouting events shown below. 115 VAC Power: is provided by a 1200 Watt AC inverter running on the car's 12 volt power system (shown in the right photo above). This 1200 watts drawn from the car's 12 volt system is augmented by the 100 Amp DC/DC converter from the car's propulsion batteries and generators. When you can take solar power where you need it, then its value can be far greater than 15 cents per KWH and is cheap at any price. . Just consuming it in the Prius is an equivalent payback of 30 cents per KWH compared to the 15 cents at home. . Plus it reduces dependency on foreign oil! . A 1200 Watt AC inverter in the back (see photo above) provides plenty of AC power to go. Emergency Solar Power Trailer: We had a few extra low voltage 20 year old solar panels so we put them on the solar trailer to the right. 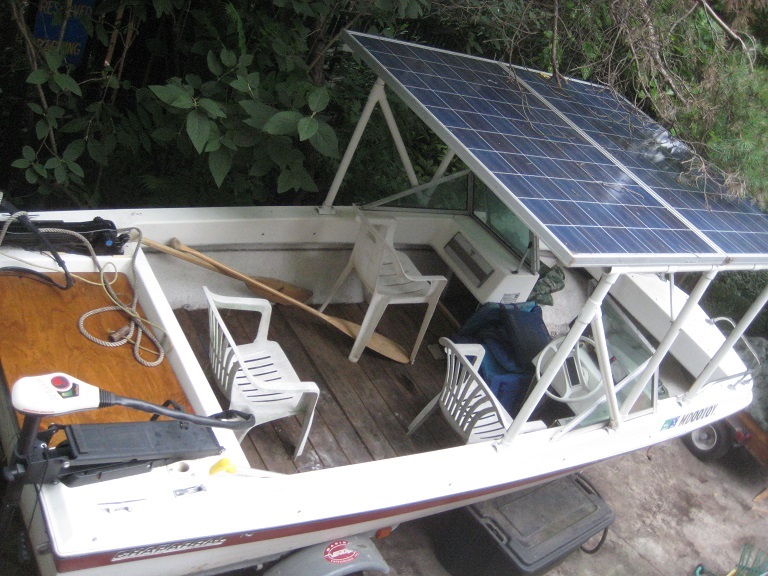 It contains about 300 watts of solar panels plus a deep cycle marine battery and 1200 Watt inverter. The top wood section of the trailer folds over to not only protect the solar panels during travel but to also hide them out of sight when parked or not in use. When closed, the top wood section looks like an open top trailer with about 6 inch sides. The false bottom conceals the nested solar panels. 220 VDC POWER CONNECTORS: . A significant issue with distributing 220 VDC power is finding a safe connector that is innexpensive and readily available yet, cannot be confused with any other electrical connector. . This connector must be unique to prevent anyone from plugging in any non 220 VDC device. . The connector we came up with was a standard power plug but with a PREVENTION device to prevent inadvertant plugging in of other devices. The connector is shown above right. A standard receptical is used, but a 3/16ths inch nylon protrusion is fixed to the center of this receptical in between the two prongs. . This blocks the use of any standard 115 VAC plug. . To make a mating compatible DC plug, a standard replacement plug is used but the center is drilled out to pass this blocking pin as shown in the photo. . On the right, this center pin protrudes into an unused, and isolated area of the hard plastic plug construction. . These connectors cost under $2 each for both the plug and the receptical. Lightweight Power Cords: . Because of the lower current demand at 220 VDC, for the same power, a #18 zip cord can easily carry plenty of power over hundreds of feet. . In the reel to the right, the original 25 feet of bulky orange cord was removed and about 100 feet of #18 lamp cord fit nicely on this convenient spool system. . The current carrying capacity of #18 is as high as 10 amps, but we limit mine by fuses to only 5 Amps. . Again, the outlets are blocked from any inadvertant use by the uninformed by the pin-blocking system. . Only switching power supplies or other loads that can operate on 220 VDC are provided with these matching plugs. Note: Almost all modern electronic systems that have universal power supplies (100-240 VAC) will also work just fine on 150 to 330 VDC too, since that is what the full-wave rectified AC becomes internally before it is switched to its final usable internal voltages. 220 VDC Switching Power Supplies: . The reason distribution at 220 VDC is simple is beacuse almost all modern power supplies are designed using switching regulators to elminate the large, heavy and bulky 60 Hz power transformers. These switching power supplies work on DC input that is obtained from 115 VAC or 230 VAC via an input rectifier as shown above. . 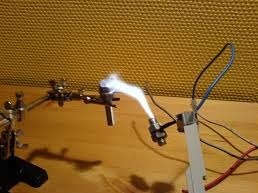 These supplies when set to the 230 VAC position will also work well on 220 VDC. LAPTOP Power supplies: . For simpliity, most laptop switching power supplies are also dual voltage (115/230 VAC) but to avoid the hassle of a switch, the supply is simply designed to operate on any voltage between 115 to 230 VAC directly without a switch. These supplies can often be plugged directly into 220 VDC. Any experimentation you do with your Prius or your Electronics is at YOUR OWN RISK! These notes are only intended to share our results and for no other purpose! Bottom line: . The time is now to go solar! We cannot continue to send billions of dollars a day overseas to buy polluting oil for our energy needs when it is right there outside our door. Also think in terms of your total energy footprint and consider how to integrate your transpotrtation demands into your own home solar system and energy needs.